Gardner: Leftfield Pictures sues over aborted Fox Biz reality show. Lean Forward: MSNBC host circulates false Scott Walker report. CNN signs Tal Kopan. Hillary advisor Patti Solis Doyle joins CNN. Miller: How MSNBCNN are helping Donald Trump. Weekend numbers. Darcy: Julie Banderas returns fire at woman who tells her ‘speak English’. WaPo‘s Wemple wonders if Rupert Murdoch tells Fox pundits what to say. MSNBC signature series comes to Savannah. Campbell Brown resurfaces. Reliable Sources videos: Trumpalooza, billionaire Trump, Reddit. Today’s (not entirely serious) firing demand. Q&A: Randi Kaye. Q&A: Ali Velshi. Paris presses forward. Sunday talkers: preview. Shocker: Rachel Maddow lies about Fox News. Again. You can count on CNN. Trumpgasm: CNN can count to 239. Q&A: Doubling down with John Walsh. The top five Olby exits. Is Sanjay Gupta the new Brian Williams? Kaplan: Eh, not really. on the Sanjay Gupta controversy. The Property Man is coming. Zucker play: It’s Morton Downey Jr! (MS)NBC stars to host the totally nonpartisan ‘Global Citizen Festival’. Market glitch nets record ratings at FBN. Wemple: Megyn channels Bill? Fox News and Megyn Kelly defeat defamation lawsuit (v/FTV). Wemple on Watters: ‘Good journalism, outstanding television’. Burgeoning field of candidates has FNC in heightened demand. CNN in ‘missing plane’ mode with Trump coverage (v/CNNC). Concha: Pundits dismiss Trump but give him endless coverage. Video Q&A: Greg Gutfeld on media, news, and his new show. Video: Behind the scenes at New Day. Clinton Q&A no smash. Tur vs Trump: Wemple, Kirell, Campbell. CNN: Just Joshing? Chariton: Olby back at MSNBC would be planting a ‘time bomb‘. Lowry: It’s time for MSNBC to bring back Olby. ICN: No it’s not. Wemple: Is the no-go-zone lawsuit a no-go? Weekend numbers. Glass House: Maddow attacks Fox over debate rules that MSNBC used! Does the news about Olbermann spell trouble for Chris Hayes? who says Hollywood knew about Bill Cosby. Somerby: Maddow’s coverage ‘as dumb as ever seen on cable news’. FTV Live: Did CNN’s Dr Sanjay Gupta lie? Video Q&A: Tamron Hall. As Megyn again tops O’Reilly, her weekly Factor segments have ceased. CNN reality shows to return. Keilar’s Hillary confab: Zurawik, Nolte, Wemple, Allahpundit. No disclosure. Alexandra Jaffe jumps to NBC. Q&A: Robin Meade (via CNNC). Q&A: Maria Bartiromo in Denver; Jo-Ling Kent on crisis in Greece. Somerby: What happened when Maddow said “Mark my words…”. Friday’s numbers: Bill O’Reilly-Megyn Kelly-Doug McKelway 1-2-3. Impartial MSNBC journalist named to prestigious honorary institute. Concha: Tapper twitter spat brings to mind the Chris Hayes quota policy. Somerby: Why has MSNBC been avoiding discussion of the trade deal? Tapper triumphs in twitter spat. Soledad moonlighting. CNN’s got Style. Hillary grants first national interview to CNN’s Brianna Keilar. Flashback. Donald Trump vs Brian Williams: Is (MS)NBC trying to have it both ways? Winner of comic reality show contest gets to do weather forecast on CNN. Vaccino: Today’s complaint about cable news debate criteria (v/ TVNewser). Reliable Sources videos: Trump’s lawyer, Trump’s campaign, Trump’s verbiage. Wemple: Creator of gay pride flag still waiting for apology from CNN. Tamera and Adam’s beautiful Ariah Talea. Q&A: Gretchen Carlson. Chariton: MSNBC execs stumped on what to do with Brian Williams. Goodman: You know who should hire Olbermann? MSNBC, that’s who! Q&A: Rachel Maddow, Abby Huntsman, Mika Brzezinski (v/TVNewser). Irony: Al-Jazeera America op-ed accuses CNN of airing propaganda?! Fireworks on FNC. Lynne Russell and Zuckersuckers. Greta goes fishing. on media independence. Profile: Dana Perino. Greta rips ‘dishonest’ Hillary ad featuring her, wants it taken down. Profile: Gretchen Carlson. Is Don Lemon seeking greener pastures? Gibson: Attacks on Fox News are driven by bitterness and resentment. Wemple: Federal government ‘active shooter’ alert led to false reports. Wemple: Emails show Begala analysis strikingly similar to talking points. Q2 program ranker: viewers (FNC holds top 14 slots), 25-54 demo. Concha: CNN needs to really rethink its relationship with Begala. Weaver: MSNBC’s Axelrod caught lying about Hillary emails? More. 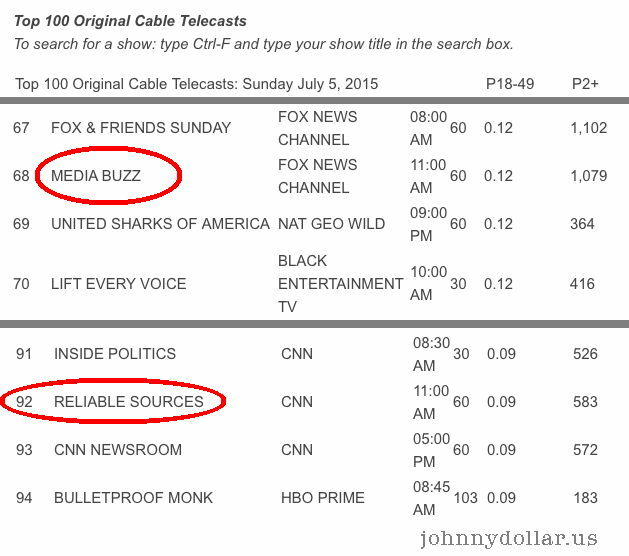 O’Connell: Cable news ratings continue to rise…except at MSNBC. CNN alums Lynne Russell and husband survive armed robbery/assault. Gretchen Carlson and the War on Christmas; 25 things you don’t know. Kilmeade a latch-key kid. Mann: You know what we need? A war on Fox!